Yes, moving Microsoft Office into the cloud increases flexibility for users. But for network people, our ability to support and monitor, just got a whole lot harder. Have you heard of AppNeta? 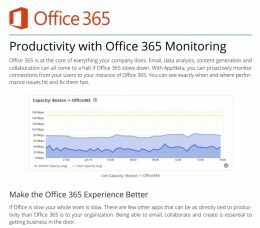 You can proactively monitor connections from your users to Office 365. And see exactly when and where performance issues occur. The Whitepaper explains in more detail, with example graphs too. You'll need an appliance and an annual subscription to the service, or several if you have multiple locations, but prices start from as little as £1,500 a year. Why not ask us for a trial? You'll be able to see for yourself and gather some great evidence for those upstairs.